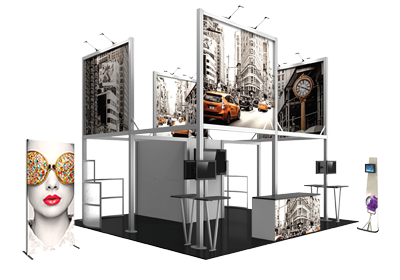 Hybrid Pro™ Modular Kit 29 is a modular 20ft x 20ft island exhibit kit that offers a plethora of features and a modern appearance. The center floor-based display is nearly 8ft tall and 8ft wide and includes three shelves on each side. A lockable door on the side of the center structure allows for accessible and secure storage. Triangular shaped fabric side walls offer a modern, angular look. Fabric graphics on the center structure are a combination of pillowcase fabric graphics (on the triangular side walls) and push-fit fabric graphics on the center walls. Two kiosks are included, which are similar in construction to the center display. Both kiosks offer four sides for graphic messaging, as well as three shelves for small product display. Counters shown are not included. Last but not least, a lightweight pill-shaped fabric structure caps the display for ample branding above eye level. No rigging required!